Soft Touch Dentistry is your source for high quality custom night guards. We are a family dental practice that is passionate about helping patients of all ages maintain and achieve a healthy, beautiful smile for life. From the moment you walk in our doors, you will realize that Soft Touch Dentistry makes your comfort our priority. We deliver state-of-the art family dental care, equipped with the latest dental technology and technique, in a warm, caring and stress-free environment. Dr. Sarah Thompson is an experienced and highly skilled dentist who specializes in providing custom night guards for patients who habitually grind their teeth during sleep. Do you clench or grind your teeth while you sleep at night? If so, you could be causing damage to your teeth and gums. In addition, teeth grinding can also result in Temporomandibular Joint (TMJ) disorders and painful symptoms including headaches, neck pain, ear pain, ringing in the ear and dizziness. At Soft Touch Dentistry, we offer a custom fitted mouth guard to prevent teeth grinding and protect your smile. Dr. Thompson uses mouth guards that are skillfully fabricated in a dental laboratory by licensed dental technicians using the highest quality materials. Choosing our custom mouth guards means you gain a comfortable solution that will provide long-lasting prevention against tooth damage and TMJ problems. For a gentle and modern dental practice that you can trust for your entire family, choose Soft Touch Dentistry. We provide preventative, restorative and cutting-edge cosmetic dental services to our patients. Regardless of the severity of your dental concern, we take a personalized and caring approach to help you achieve the most healthy and attractive smile possible. Contact our dental practice today to learn how we can protect your smile from teeth grinding. We accept most dental insurance carriers and we offer flexible financing plans for your convenience. We look forward to serving you with comprehensive family dental care in a positive environment. Went here for a root canal and got the sedation. I loved it. No memory and no worries. They have a friend for life. If you need a great dentist, try this place. My husband and I adore Dr. Thompson and the entire staff. They are friendly and fun and go out of their way to make you comfortable. The facility is always immaculate as well. Highly recommend! I always have a very positive experience when I visit Soft Touch Dentistry. Dr. Thompson has done two crowns for me that turned out nicely and the staff is very professional. I visited their new location and the first thing I noticed was the smell of pumpkin spice candles when I walked in the door. The waiting room is homey and their television is set to HGTV. Makes the wait very pleasant! I had my first visit here this afternoon and I love it. There is no doubt that I will be making this my primary dentist! The staff is friendly, thorough, and patient. I definitely suggest checking them out. Every aspect of the care my young son and I received at Soft Touch Dentistry was excellent. Everyone is kind and professional, and makes a visit to the dentist as easy and comfortable as possible. Highly recommend!! I'm always terrified to go to the dentist. But every time I've had an appointment here, I always leave asking myself why I was so scared! Very comfortable and pleasant atmosphere, kind and friendly staff... I honestly can't think of a single bad thing to say about this place. Love it! Dr. Thompson is simply the best. She’s kind, gentle, and knows how to make her patients feel at ease. Her staff has the best customer service skills that I have ever seen in a medical practice. I would highly recommend Dr. Thompson to anyone looking for a dentist. As someone who is extremely anxious about getting dental work done thanks to years at a pretty awful pediatric dentist, I was so relieved to find out that dental work can actually be pleasant. I started going to Soft Touch about 3 years ago, and I really would rather not go anywhere else. Friendly, professional, down-to-Earth place with awesome staff. And it doesn't even smell that much like a dentist's office, which is probably the best part. I served 8 years in the military and I have seen about 15 different dentists in that time. I was referred to Soft Touch Dentistry by the VA. I had several teeth that needed crowns. These ladies are amazing. They actually listen, constantly check to see if your in pain. They are gentle, fast and efficient! My crowns are beautiful, and came back in about 2 weeks from the lab. 2 weeks wasn't bad, considering the temporary crowns they gave me looked great and fit my mouth just right. Best experience I've had with a dentist's office. Consider this a rave review! Soft Touch Dentistry has the best collection of kind and meticulous dental assistants and hygienists, as well as an incredibly talented, knowledgeable and honest dentist. My teeth are in great hands and my cavity feels amazing. Thank you Soft Touch! Dr. Sarah and her staff are wonderful! After chipping my front tooth and searching for a talented cosmetic dentist, I discovered Soft Touch Dentistry and Dr. Sarah Thompson, and I am so glad that I did! She explained all of my options, calmed my nerves, and repaired my tooth with a veneer that looks just like my natural tooth! She even came in on a Sunday to repair my temporary veneer that had come loose!! I have already recommended Dr. Sarah to all my friends! My family and I have been coming here for years. Belinda, the smiling face at the front desk, is so pleasant and helpful. All of the staff are super friendly. Dr Thompson is the best dentist I've ever had. Years prior to coming to Soft Touch I had a horrible experience that caused fear to go to the dentist. Soft Touch Dentistry has changes my mind about going to the dentist. My husband and I have been coming to Dr.Thompson for 01-2014 and each and every time we've come the staff is fantastic,very caring and understandable. Dr Thompson is wonderful at what she does very informative about what she's going to be doing.I have not experience any pain since we've being coming here.Satisfied with her work when I leave the office. The office and area where she and her staff does there work is always clean that's a plus for me.Also the staff and herself greets us by name if I can recall after the first visit they all remember and that's awesome.Music is Great! If anyone out there looking for a FANTASTIC CARING DENTIST DR.THOMPSON IS THE ONE. The Best In Our Book!! We have a big family (5 kids) and they are always very accommodating. They are also great with the kids! The conscious sedation is great, too. I had a root canal and crown replacement. The whole thing was painless. Just a fantastic office all the way around. My girls and I have been going here for almost a year now and we absolutely love it. The staff is professional, very knowledgeable, and overall helpful. They all work very well together. I never really enjoyed actually going to the Dentist until I started going here. I never have anxiety as I used to. Dr. Thompson is really good. She always explains what my options. Things are explained in detail of what's going on at every step of the visit. As we all know kids are tough critics and my girls always have great things to say when we leave the office. The entire staff is doing an amazing job in my opinion. I recommend them 100%. Let me start by saying, I've never been a fan of going to the dentist, but Dr.Thompson and the whole staff at Soft Touch Dentistry are super friendly, professional and very attentive to your needs, making the whole experience pleasant. They've definitely taken away the fear and nervousness.... I'll be back in 6mos! 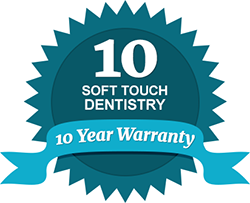 I have been going to Soft Touch Dentistry for 5 years now and love them. The ladies are awesome and it's so nice to go to a place where the staff remembers you by more than just a name on a record. Recently received a phone call to wish my 2 year old son a Happy Birthday which is above and beyond! My review of Soft Touch Dentistry couldn't be less than perfect. From the Office manager Belinda who was very patient with my schedule, and the Professionalism of Mrs. Sherrod ,and Dr. Thompson who made the process very comfortable. I left there getting a Fresh start to a Fresh Smile So if you are able to visit Soft Touch Dentistry get ready for a warm, friendly, and most important an effective way to get your Dental needs met. Thank you Team Soft Touch Dentistry. I will recommend you all to everyone. I found this place on google and thought I would give them a try because they have sedation. After going here, I can honestly say that I was pleasantly surprised by the customer service and attention to detail during my visit. I don't know which was better the way the staff treated me or the way the doctor did. Both were awesome. I actually look forward to my dental appointments now. I have to give Soft Touch Dentistry 5 stars because every time I visit this office, I am glad that I did. I first went here just to get a second opinion on getting some veneers done. From the receptionist to the doctor, everyone was so sweet. I hooked from just the level of customer service that I received. I was impressed with Dr. Thompson's before and after pictures of patients that she had done. I wanted to be one of those before and after pictures. I decided to get all of my veneer work done here and I love them. I did have to go back for 1 adjustment about 1 week later (took 15 minutes) because of some slight pain in one of my teeth. But after that adjustment, I didn't have any pain. I'm so glad that I found this place. I had gone to several other dentists before selecting this cosmetic dentist, but most of them didn't even have before and after photos that they could show me and of the ones that did have them, they just had a few that didn't even look that great. Makes you very comfortable and welcome, awesome job in my dental process. Staff is very friendly. Really glad I made a decision to choose this dentist. The staff are courteous and friendly and their professionalism is really top notch. It really made going to the dentist a less upsetting process. My wife recently started going here too and the results have been really great for both of us. Very nice people, I would definitely recommend them to everyone. Just like the other reviewers here, I've had great experiences! After several weeks of online research, I found this office and I know I found the best. From making my 1st appointment to getting my front 4 teeth veneered to getting 2 wisdom teeth pulled with heavy sedation, to my follow-up cleaning appointments, everything is always soft, smooth and relaxing. Doctor was fabulous and the assistants were wonderful! I recommend this place with flying colors. I went to them for porcelain veneers after looking online. I think Dr. Thompson is the best. I live in Missouri in St. Louis County and drive 45 minutes to this office, passing many dentist along the way. It took me 3 appointments to get my 8 veneers. 1st appointment was like a consultation, the second was when all the work was done, and third was when porcelain veneers were put on. Loving my teeth right about now. Not a problem with any. My family of 5 have been patients of Dr. Sarah Thompson, a top-notch dental professional, and her wonderful staff for the past five years. Excellent provider/customer service: professional and effective clinical team; warm and engaging staff who will help you prioritize the work you need done and work with your insurance provider to ensure you receive your entitled benefits; great office/clinic atmosphere. We feel valued by this team, and we receive excellent service. Dr. Thompson and her staff are true professionals that make it extremely easy to go to the dentist. I found my experience with them to be extremely rewarding and pleasant. I believe in their knowledge, skills, and abilities to provide me the best dental care possible. I highly recommend for anyone needing a good dentist. I found this dentist online after searching for someone to do my 8 veneers near St. Louis, MO. I was very impressed by the online stuff that I read about Dr. Sarah Thompson, and when I went to the office, I was more impressed. She's the nicest dentist that I've ever met. Her price to place 8 veneers was about 70% of the lowest quote I had gotten at another office. Not only did I save hundreds of dollars, but I am extremely pleased with my results. I would really really recommend Soft Touch Dentistry in O fallon, IL to anyone needing veneers done right the first time. I really like Dr Thompson and her staff. My teeth look great because of her work! The dentist here was super nice. Pulled my wisdom teeth while I was under sedation and I did not feel a thing. Usually scared to death of dentist but my experience here was wonderful. I just had to leave a review because this dental office is the best. I have to give it up to this place. I found them online and decided to make the trip across the river to see if they could do what they claimed online. All I can say is that I was blown away by the customer service of the first desk girl, she was great. Then Dr. Thompson comes in to the room and she was like icing on the cake. So nice, gentle and sweet. I made an appointment to come back for a bridge and got it done 2 weeks later. It looks wonderful, the service was wonderful and my time spent there was wonderrful. Did i mention the service was wonderful? Went here to get a second opinion after going to a dentist in my local area. The dentist here was so nice and gentle. I needed a root canal and 2 fillings and 1 tooth pulled. I have NEVER liked the dentist, so I was totally scared before going here. However, this place sedated me and all I remember is getting in the dental chair and getting out of the chair with everything done. This was a dream, literally. I've been back several times since then for cleanings and a crown, and the doc really has a way with people that makes you feel special. I would recommend this spot if you have major tooth problems and you're scared. #TotallyEnjoyedMyself. My family has been going to Dr. Thompson for 5 years. Great service all around; I would recommend her 100%!! I wish that all dental offices could be like this one! I called in major pain and was able to get in the same day. They greeted me with a smile and called me back quickly. I didn't have insurance and they gave me a great price, so I could get the work done the same day. I love this office. I am an extremely difficult person to please. I went to Dr. Thompson because she advertised sedation. My thinking was that anywhere that will knock me out for my dental work, was a place I wanted to go. I loved the experience. I was soooo nervous before going, but so glad that I got over my nerves and went. I ended up getting a root canals, 2 teeth pulled, a bridge, and 2 crowns. At least that is what they told me that I got because I don't remember my appointment, which is GREAT! I started going here 12 months ago for Invisalign. Dr. Thompson estimated that my treatment would take 13 and a half months. So, with 1 and a half months left, I can say that I love my smile and that's why I'm leaving this review. Even though I am not completely finished with my Invisalign trays, I am extremely happy with the progress. My teeth look just like the images that they showed me in the begging of treatment. After interacting with this office for the past year, I can say that my visits are always smooth and enjoyable. I would recommend them to everyone. The place lives up to the reviews and pictures. I went here 4 months ago for just one porcelain veneer but I wanted to wait a few months before leaving a review so I could be sure of what i was saying. They matched the veneer to my other natural teeth perfectly. I'm really happy because no one can tell that I have a veneer on my front tooth even when I point it out to them. My biggest concern before getting the veneer was whether it would be bulky but it wasn't. It looks like it belongs with all my other teeth. Very very impressed with the service at this office.